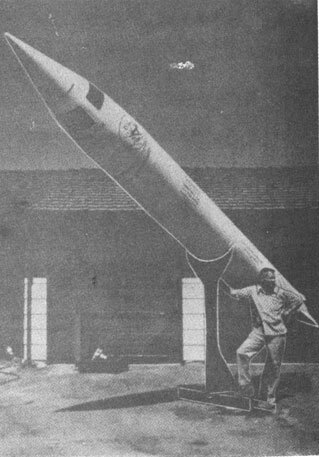 The Volks-rocket and its designer, Robert Truax. The vehicle makes a maximum use of proven components to decrease cost and improve reliability. 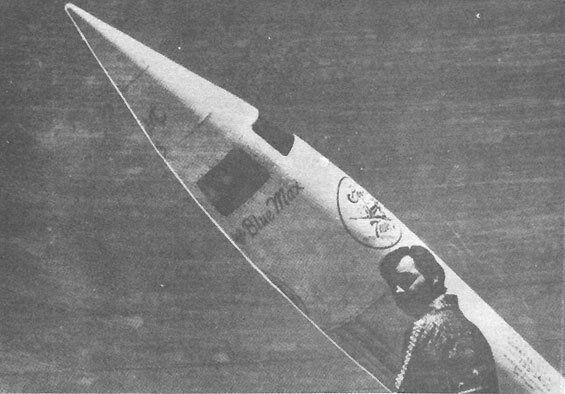 In our issue of January 1978 we looked into the claims of the West German company of OTRAG to go into space by low technology. We have since heard of another "private venture" space project being pursued by the veteran rocket pioneer Robert Truax in the United States. Since the space age began, people have watched rockets climb into the blue Florida sky and beyond; thinking to themselves "if only....." One need not have the advanced degrees, perfect health or the thousands of hours .of flight time this frontier has demanded to be attracted towards it. Yet, because so few people meet these requirements, spaceward ambitions must remain a dream. If Robert Truax and a small group of associates are successful, that no longer need be true. Robert Truax brings some forty years of experience to his private manned space flight programme. He is the former director of the Advanced Development Division of Aerojet General Corporation. Before and during World War II, he worked with the U.S. Navy rocket programme, was part of the Atlas and Samos projects and was decorated for his work on the Polaris missile concept. He was, also, one of the organisers of the ''Big Dumb Booster" idea [ 1 ]. After retiring from Aerojet General, he built steam rockets for drag racing. Then, in the early 1970's, he began to study the possibilities of a small manned sub-orbital re-useable booster constructed of surplus rocket components. The "back of the envelope" calculations were interesting enough for him to begin buying used parts. In the meantime, motorcycle stunt man, Evel Knievel had used one of Truax's steam rockets in an attempt to jump the Snake River Canyon (Truax designed and built the Skycycle X-2). Knievel came to Truax afterwards and asked if there was anything that could top it. Truax responded "for a million dollars, I could make you the first private astronaut." Knievel was interested enough to pay for a feasibility study. It confirmed Truax's initial estimates. The X-3 Volks-focket, as Truax likes to call the vehicle, stands 24 ft (7.32 metres) tall and is 25 in (63.5 cm) in diameter. Empty weight is 1.100 Ib (500 kg); fuelled it weighs 3,100 Ib (1,409 kg). The propellants (liquid oxygen and kerosene) are pressure fed to four Atlas vernier engines (Rocketdyne LR 101's) giving a total thrust of 4,000 Ib (1,818 kg ). A propellant utilization system insures simultaneous depletion of both propellants. Guidance is provided by HIG-4 floated gyros. Components would be sealed against salt water contamination; exposed portions would be washed off with a fresh water hose. The vehicle is designed to reach an altitude in excess of 50 miles (80.5 km) qualifying the passenger as an astronaut. When Truax began development, the major problem was with the engines. The Atlas vernier engine's fuel system was designed to feed a single engine. Truax had to design a new manifold and gimbal system. Up to late 1978, six static tests of the new fuel system have been made. For these early tests, only one engine was installed. Also tested were the steering servos which gimbal the engine. Engine operation, at reduced pressure, was checked. This allowed the removal of one of the two pressurised helium spheres in the original design. All tests were successful. In addition, there have been two tests of the life support system. One was a test of the passenger capsule's pressure integrity. Second, was a 30 minute manned, sealed test of the capsule. This checked out the life support system's function for the time necessary to count down, launch and recover. Smaller component tests, such as on regulators, were also run . All space programmes have funding troubles, even private ones. Because of this, development has been slow and the launch date is uncertain. It could be as soon as 18 months (immediate full funding) to five years (Truax's own resources). Total development costs are estimated to be between one-half and one million dollars. Like other commercial endeavours "Project Private Enterprise" has sought sponsors. Truax has, so far, recruited a travel agency, a solar energy company, a San Jose water bed firm, a Greek restaurant and a car stereo store . TV networks have also expressed interest. In the future, the hard mock-up will undergo static tests. Manned drop tests will help select the optimum splashdown velocity. The data will be used to size the main parachute. After these are completed, it will be dropped unmanned from a helicopter at an altitude of 20,000 to 25,000 ft (6,096 to 7,620 metres) to test the recovery systems and fleet (a large boat divers, 2 helicopters and an aircraft. ) A secondary goal is structural checks. Ground tests will be used to insure maximum reliability. Truax estimates a 90 to 98% chance of survival for the first flight. Candidate astronaut, Martin Yahn and the capsule in which he will ride. The passenger capsule is divided into two parts' a short cylinder in which the astronaut sits and the nose cone which fits over it. Two flight rated Volks-rockets will be built at a cost of $300,000. They will be used first in an unmanned flight. After a completely successful flight has been obtained, a manned mission will be attempted. The astronaut for this flight will be Martin Yahn, 31, of San Jose. He was selected from SO applicants and has assisted Truax during development. The idea is that the booster will be set up near the Pacific Ocean and then fuelled. The astronaut will be placed in the capsule which will be lifted by crane and attached to the rocket. The booster will be counted down and fired. TV and two-way communication links will assure contact between the launch site and the astronaut. Burn-out will occur at 100,000 ft (30,480 metres). Maximum acceleration will be 3 g's. The momentum will carry the rocket, now slowly tumbling, to peak at an altitude in excess of 50 miles (80.5 km). Through the three windows, the length of California will be visible as well as the curvature of the Earth and the deep blue-black of space. Its momentum spent, the Volks-rocket will start down. At 150,000 ft (45,720 metres) a small drogue parachute will deploy to stabilise the Volks-rocket in the proper nose-up configuration and slow it to 400 mph (644 kph) at 20,000 ft (6,096 metres) when main chute deployment occurs. At this time, a port opens to supply fresh air and the booster is lowered to splash-down. Total flight time, lift off to splash-down, is 10 minutes. If successful, Martin Yahn will become the world's first private astronaut . normal main chute deployment speed. As a last ditch, the astronaut, who will wear a chest pack parachute, would jettison the nose cone and bail out. Once the Volks-rocket has proven reliable, regular passenger flights could begin. Truax estimates that ticket costs would be $10,000 covering launch costs and profit. Because of the size of the capsule, persons over six feet (1.83 metres) would be cramped. Vehicle performance limits passenger weight to 200 Ib (90.7 kg). Anybody over this would be put on a diet before launch. As Odyssey Travel Service, one of the sponsors, puts it, the occupant would indeed have "a unique experience in travel." Truax's project, beyond the obvious implications of commercial manned space flight (however brief), is different in that it is the dream of a single individual. The early history of rocketry is one of individuals working virtually unaided. With the coming of World War II, these individuals would vanish to be replaced with a team concept; thousands of engineers working for hundreds of contractors, supported by the resources of a nation. It is, therefore, ironic that the pattern of a whole new industry is taking shape in a Saratoga, California garage. 1. Shirley Thomas, Men of Space, Vol. II, Chilian Co. 1961. 2. Phone call to Robert Truax, 11 October 1978. 3. Space Age Review, March/April 1978. 4. Space World, August/September 1978.